From golden to red hues and sweet to tart flavors, apples can please almost any palate. Whichever variety suits you, all are full of antioxidants which are linked to numerous health benefits- including the prevention and control of gestational diabetes. Apples contain an antioxidant called ‘quercitin’ which has been shown to slow the breakdown of carbohydrates into simple sugars in the bloodstream- thus controlling rapid spikes in blood glucose. Another antioxidant group abundant in apples termed ‘polyphenols’ have been shown to slow sugar absorption from the digestive tract into the bloodstream which also decreases the sharp rises in blood glucose levels. Not only do apples contain fiber which helps us feel satisfied for a longer period of time after eating (which aids in calorie intake and weight control) but they contain a special type of fiber called ‘pectin.’ When combined with other phytonutrients found in the apple, pectin has been shown to effectively lower levels of fat circulating in the bloodstream. This unique effect found only in the interaction between pectin and other apple phytonutrients can decrease the risk of developing diabetes by improving cardiovascular health- but be sure to eat the apple in its whole form to receive this heart-healthy benefit! This root vegetable isn’t only good for jack-o-lanterns! 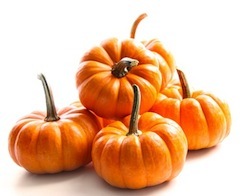 Pumpkin packs a powerful nutrition punch as it’s a great source of the antioxidants alpha and beta-carotene. Their orange color provides a clue that pumpkins contain these pro-vitamin A carotenoids (also found in other orange-hued fruits and veggies) which the body converts to vitamin A. These antioxidants not only have an anti-inflammatory effect, possibly reversing skin damage caused by the sun, but are important for a baby’s embryonic development including that of the heart, lungs, kidneys, and eyes. It’s also important that women who are about to deliver have enough vitamin A stores to help with postpartum tissue repair. Obtaining as much vitamin A through fruits and vegetables such as pumpkin is best for pregnant women, as consuming too much of the preformed vitamin A found in meats and dairy (especially liver) as well vitamin supplements can lead to birth defects and liver toxicity. A pregnant woman can consume as many pro-vitamin A carotenoids from fruits and veggies as she wants and will not be at risk for toxicity. Think twice before tossing those slimy seeds in the trash- these are the perfect little nutrition packages. Pumpkin seeds are a good source of magnesium, manganese, phosphorus, copper, iron, protein and zinc- all essential nutrients for a healthy pregnancy. Just a quarter cup provides almost half of the daily value for magnesium which helps build and repair body tissues during pregnancy, as well as half the daily value of manganese- a mineral that helps a baby develop bone and cartilage and protect cells from damage. Not only that, but these seeds provide one of the best sources of phytosterols from the nuts and seeds group. Phytosterols have been shown to reduce cholesterol levels, and are such powerful compounds that they have even been extracted from soybean and corn oil to be added to processed foods such as butter replacement spreads which can then make cholesterol-lowering claims. With all the amazing nutrition apples and pumpkins provide, try to take advantage of these fall superfoods while they’re in season. For a diabetic-friendly snack, combine apple slices with almond or peanut butter, or with a serving of cheddar or Swiss cheese. Pumpkin puree can easily be added to moisten baked goods such as pancakes, muffins, and bread as a replacement for some of the butter in a recipe. For tasty roasted pumpkin seeds, let seeds dry on paper bags overnight, then spread on a cookie sheet and bake at 160-170 degrees for 15-20 minutes. Enjoy them on their own or shred and added to yogurts, hot or cold cereal, or in oatmeal raisin cookies. Don’t let yourself or your baby miss out on affordable, accessible, and nutritious fall foods this season!